SAN FRANCISCO -- San Francisco police have released body camera footage of a shootout that killed a suspect and injured five other people, including an officer, inside of a barber shop, CBS San Francisco reports. The video was shown during a tense town hall meeting where there was conflict even between members of the family of the 21-year-old man killed. Police did not disclose who shot the four other people who were injured. It remains unclear from the chaotic and graphic body camera video. One of the victims suffered life-threatening injuries, however, police say all of victims have been released from the hospital. According to Capt. Valerie Matthews, the shooting happened on March 21. Family members had reported that Jehad Eid was threatening them, flashed a gun and was trying to break into their garage. When police arrived, the family said he had gone to the barber shop. Eid stood up and shot at the officers upon their arrival. Two cops returned gunfire, shooting 26 bullets at Eid, who then shot nine rounds from a .40-caliber handgun. He was struck 18 times. 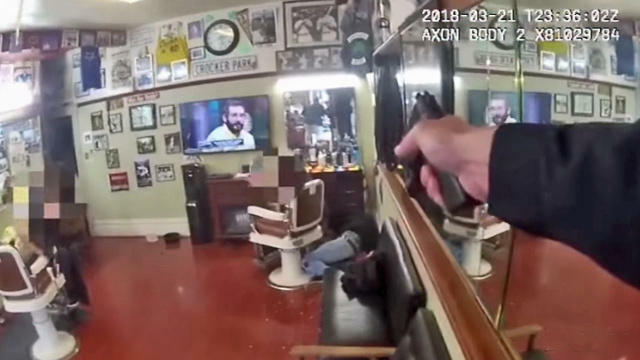 The video includes footage from one of two officers who opened fire inside the barber shop, video from an officer standing outside and dash-cam video from a patrol vehicle parked outside. In the first clip, the officer enters the barber shop along with a plain-clothed officer. Two people are seated on a long couch. Both officers draw their guns and begin shooting at the back corner. The officers drop to the ground and move behind a barber chair. Then, one officer reloads his gun. There is no audio in the video until the shooting is over. When the audio turns on, one person can be heard yelling, "I got kids here! I got kids here!" The suspect in the corner is crumpled to the floor. The uniformed officer, who was shot in the leg, eventually crawls out of the shop onto the sidewalk. The other officer was not wearing a body camera because she was in plain clothes, Matthews said. The second clip shows officers standing outside when the shooting happens. They are handcuffing an unidentified man and duck behind a car when gunshots are fired. One of the shop's barbers who spoke at the meeting identified himself as Chad and said he was the person being handcuffed in the video. He criticized the police response and said he was arrested because he was mistaken for the suspect. Once the shooting broke out, he said police pushed him into the line of fire while they ducked for cover. Video shows him trying to kneel behind a car while still cuffed as officers take cover with their guns drawn. "It should've been treated like a hostage situation," Chad said. "The guy was in there calm." Chad said he knew Eid and called him a "really good kid." He said Eid "never meant nobody no danger." At least two other people who said they were wounded in the shooting were at the meeting. Chad said that they were unable to work now because of their injuries. One of the victims said that he didn't know who shot him. Chad said that an officer's bullet nearly hit the head of a man in the shop. Eid's family was split on what to think of the shootout. A representative, who did not identify himself, read a statement apologizing to police on behalf of the family, saying that they regret that the shooting may give ammunition to people seeking greater gun control. The family said they are "in deep mourning for our beloved Jehad and regret there was nothing we could do to prevent this incident." But another man who identified himself as Eid's uncle yelled back after the statement, saying that the person did not speak for the whole family. He later spoke himself, saying that he had no ill will toward the police but he was not satisfied with the information given and wanted more answers. "He was a very sweet kid," the uncle said. "He did not have to die."